Chilly fall days are a GREAT time to get out and camp. 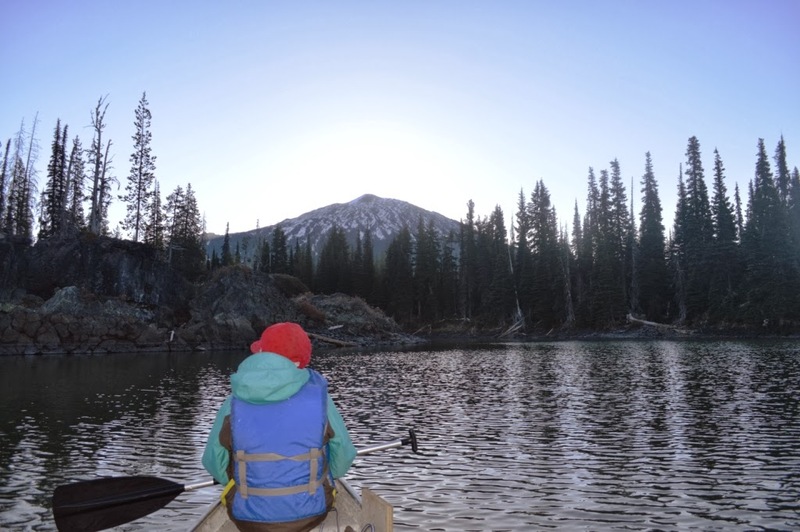 We headed to Sparks Lake in Central Oregon with the canoe to enjoy a weekend of solitude. To get there: From Bend, drive about 20 minutes on Cascade Lakes Highway, go past Mt. Bachelor and in a few miles you turn to Sparks Lake. Go to the boat launch. You'll need a NW Forest pass or pay for day use. Launch and paddle south. The east side of the lake seems less trampled. It is more rocky, but way more interesting with deep lava canyons, slot canyons to climb around, lava bridges, and more-a playground for anyone! After setting camp we headed to Mt. Bachelor. An easy rolling trail to the base of the NW Chair. It was fun to see the ski area stripped of its winter blanket. We hiked up to some early season snow and then headed back to camp. With an easy pace we did the whole jaunt in about 4 hours. Paddling the next day around the lake through freshly minted ice that crackled thru' our oars. The lake also has a drain in the middle of an inlet. You can paddle right up to the swirling water.